Women entrepreneurs in Bangladesh face more obstacles compared to men in business. Photo credit: ADB. In Bangladesh, women-owned small and medium-sized enterprises (SMEs) have different characteristics and specific challenges and obstacles when compared with those owned by men. The Small and Medium-Sized Enterprise Development Project supported the development and expansion of SMEs in Bangladesh from 2009 to 2013. In specific pilot districts, the number of women-owned SMEs increased by over 10%. The training of women SME owners in business development; accounting, loan application rules and processes; and in the regulations governing businesses facilitated their improved access to institutional finance. The formation of advocacy groups and membership in different associations enhanced the confidence of women SME owners and their ability to lobby for policy changes. Dialogue and relation building between participating financial institutions and women's SME associations helped foster mutual understanding and cooperation, leading to better outcomes for women-owned SMEs. Participating financial institution policies and products require further adaptation to meet the needs and circumstances of women-owned SMEs. Training of women entrepreneurs improves their access to institutional finance. Photo credit: ADB. There are nearly 1.5 million SMEs in Bangladesh, of which 60%-65% are located outside the metropolitan areas of Chittagong and Dhaka. SMEs constitute almost all private industrial establishments and provide jobs to 70%-80% of the country's nonagricultural labor force. 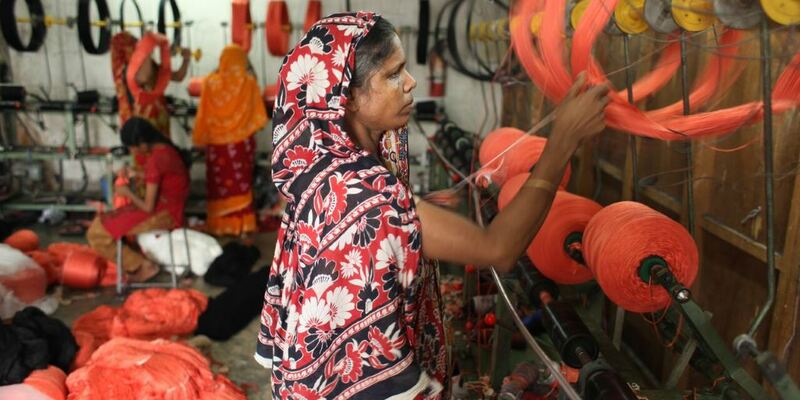 Women own less than 10% of the industries in Bangladesh, with 70% of these being micro and rural industries. SMEs have a great potential to reduce poverty and enhance employment and income, especially in the rural and nonmetropolitan areas of Bangladesh. Limited access to institutional finance. In 2009, SMEs could meet only 25%-30% of their capital requirements through bank loans, especially in nonmetropolitan areas. Although 75% of SMEs in nonmetropolitan areas required financing, only 6% were actually provided with formal financing. Start-up SMEs find it particularly difficult to borrow from banks. Limited access to markets. Most SMEs in nonmetropolitan areas sell their goods and services directly to consumers located close by. Expansion of markets is crucial to overall growth. Limited access to business-related services. Very few firms have access to marketing, accounting, or technical assistance (TA). They lack access to marketrelated know-how, market research, as well as vocational training to manufacture diverse, high-quality products. Inadequate and poor-quality infrastructure. SMEs in Bangladesh have identified poor roads, inadequate energy supply, and difficulty in obtaining land (especially serviced land) as major hindrances to development. In Bangladesh, small and medium enterprises have the potential to reduce poverty and enhance the employment and income of women. Photo credit: ADB. A gender action plan (GAP) was developed to focus on results related to women entrepreneurs. The main aims of the GAP were to promote business skills among women and to increase their access to institutional credit. The GAP was supported by a TA of $500,000 provided by ADB to the Bangladesh Women Chamber of Commerce and Industry (BWCCI) to undertake the Promoting Women's Entrepreneurship in Bangladesh project. A minimum of 15% of the credit line of the project should be earmarked for women entrepreneurs. Assess the current status of enforcement of gender-relevant provisions in Bangladesh Bank's regulatory framework. Training programs on women entrepreneurship development designed, pilot tested, and conducted under public–private partnership between the Ministry of Industry and the Bangladesh Women Chamber of Commerce and Industry. Disseminate findings and lessons from technical assistance activities at national workshops, divisional seminars, advocacy meetings, exposure visits, and trade fairs. See Gender Action Plan - output and activities. Women entrepreneurs are able to jumpstart and expand their businesses from the 453 loans totaling to $6 million. Photo credit: ADB. 5% expected increase on SME credit-total credit ratio. It increased from 21.03% in 2010 to 23.82% in 2012. A number of project features that contributed to gender equality results can be identified. The project followed good practice during the analysis and design stages. The situation analysis was based on a clear understanding of the differential position and characteristics of women- and men-owned SMEs. It identified the constraints of and opportunities for women SME owners, including the available training facilities. An assessment of the implementation of gender-responsive policies was also done. This analysis highlighted the importance of including an explicit strategy and target for reaching women-owned SMEs. The design and monitoring framework (DMF) of the project included explicit gender equality elements, including expected results with targets and indicators. The DMF tracked progress in achieving the project expected results and targets in terms of enhancing women-owned SMEs’ access to loans and achieving capacity development. The TA was instrumental in achieving the results relating to women-owned SMEs. It provided resources and a sound strategy to support improvements in the situation of women-owned SMEs in the six pilot districts. The involvement of the Bangladesh Women Chamber of Commerce and Industry as the implementing agency for the technical assistance. Selection of an appropriate implementing agency was crucial for the success of the project. BWCCI is a specialized agency promoting women’s entrepreneurship with the requisite staff, leadership, and dedication. Furthermore, BWCCI had networks in the six pilot districts. As women entrepreneurs and SME owners, BWCCI members in the pilot districts were very committed to the project. Also, networking among the BWCCI members and their cooperative attitudes contributed to the success of the project. This is the story of the confident, smiling Monowara, the first woman engaged in the decorator business in Khulna. I am the oldest among three siblings. I passed my Higher Secondary Certificate exams in 1995. I got married shortly after that. My husband was in the Navy. He left his job to start a business in 2000. I sold some land and bought the decorator business from my maternal uncle and gave it to my husband to run. But he felt it was beneath him to deal with the workers. He had an extramarital affair and left me. Currently, he is in Singapore, driving a taxi. He does not send any money home. After my husband quit the decorating business, I decided to take it over in 2008. I became a Bangladesh Women Chamber of Commerce and Industry (BWCCI) member in 2009. Before becoming a member, I did not know anything about banks and loans. After getting training from BWCCI on what papers I need and how to apply for a loan, I applied for a loan from one of the banks. They made me wait for 2 months and then told me that the bank will not give loans to decorator business. When BWCCI held a seminar with participating financial institutions, I spoke about my problem. After that, the Trust Bank gave me a loan of Tk200,000 ($2,500), which I have since repaid. Currently, I have a loan of Tk500,000 ($6,250) which I have invested in buying cloth. I now successfully run the business and support my mother, brother, and daughter. I have enrolled my 8-year-old daughter in the best English medium school in Khulna. I have eight full-time staff working for me, with an additional 25–30 people working on contract when I get orders. Among my workers, six are women. Initially, I faced opposition from family members for running a decorator business, which has been predominantly a man’s domain. Even now, they continue to scorn at my choice. But I am well known all over Khulna. I am a member of the executive committee of the Khulna Decorators’ Association. I am willing to help women who have self-confidence, to get loans from banks and start their own businesses. I encourage my women employees to open bank accounts. Source: Bangladesh Women’s Chamber of Commerce & Industries. The Government of Bangladesh accepting the BWCCI as the TA implementing agency was important. To start with, the MOF and the BB were reluctant to enter into this arrangement. As an emerging business association, BWCCI had not had much direct interaction with the government, particularly the MOF. Eventually, good teamwork among the SME divisions of the BB, the MOF, and BWCCI emerged, ensuring the smooth implementation of the project. The TA helped BWCCI build a rapport with the MOF, which facilitated policy advocacy. Cooperation between the BWCCI and ADB was excellent, with ADB being able to communicate its expectations to BWCCI and assist them in resolving issues that arose during the project implementation. Both ADB and the BB demonstrated flexibility in adapting project elements meant to achieve the project objectives. Initially, the terms of references of the grant to BWCCI did not include orientation sessions for the PFIs. The orientation sessions were incorporated as they addressed the major constraints influencing the access of loans by women SME owners. Also, the interest rate for women SME owners, which was 15% at the start of the initiative, was lowered to a viable 10% subsequent to discussions between the BB and ADB. Although the PFIs were not impressed with this lowered interest rate, the BB encouraged them to provide loans to women-led SMEs as part of the government’s pro-poor growth policy. The SMEDP loans could be given for any aspect of business, whereas other refinancing funds could be used only for capital investment. This provided greater flexibility and was more conducive for women-led SMEs as they required funds to cover operational costs, raw materials, and services. Did the TA achieve significant results in the pilot areas and can the current challenge of scaling up this type of activity be more widespread so that results can be achieved in the future? What can be done to increase the multiplier effect of capacity-building initiatives for women entrepreneurs? The focus has been on women entrepreneurs or women-owners of businesses. Yet, it is evident that many women cannot start a business (not all women are entrepreneurs), and it is also important to look at the jobs created by all SMEs. Do these provide “decent work” opportunities for women and men? Do women face specific obstacles in gaining employment? Is there gender segregation in this workforce? Is there equal pay for work of equal value? Although disbursement of loans from PFIs has increased among women entrepreneurs, it is below the target set by SMEDP. Many of the problems identified at the demand and the supply sides for low loan disbursement among women remain valid even today. A two-pronged approach of continuing to train women SME owners as well as lobbying with PFIs to switch to more women-friendly policies and products continues to be an important strategy. Check out the video of Rajesh Vasudevan of ADB's Independent Evaluation discussing the significance, challenges faced, and main recommendations on the bank's Support for Gender and Development. Learn more from Imrana Jalal, senior social development specialist (Gender) of ADB as he introduces ADB's gender and development e-learning course.